WASHINGTON -- U.S. media are reporting that the White House has developed a plan to force out Secretary of State Rex Tillerson and replace him with Mike Pompeo, the director of the Central Intelligence Agency. The Associated Press, Reuters, Vanity Fair, and other news organizations also reported on the possible departure of Tillerson from the State Department, citing unnamed senior officials. The New York Times added that under the plan, Senator Tom Cotton (Republican-Arkansas), a key Trump ally, would likely replace Pompeo at the helm of the CIA. "Secretary Tillerson continues to lead the State Department, and the entire cabinet is focused on completing this incredibly successful first year of President Trump's administration," spokeswoman Sarah Sanders said in a statement. Moments earlier, when asked about the reports ahead of talks with the visiting crown prince of Bahrain, Trump said, "He's here. Rex is here" for the meeting. The New York Times said it was not immediately clear if Trump had given his final approval for the changes, which would represent a major shakeup at the top of the U.S. administration. U.S. media have reported that the U.S. president lost confidence in Tillerson, the former chief executive of energy giant ExxonMobil Corp., who was without previous diplomatic experience. The president and the secretary of state have often contradicted each other in public statements regarding major international issues. Tillerson has also been criticized by Democrats and some Republicans for weakening U.S. diplomacy by not filling major positions at the State Department. 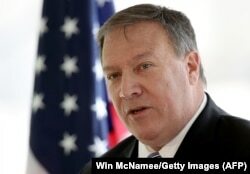 Pompeo is a former three-term Republican congressman from Kansas who has been a strong Trump supporter.